Property 3: Walk a Block to Uptown (Our Downtown) to the main shops, tours, restaurants. Canyon Mesa Country Club Town-home with Red Rock and Golf Course Views. Property 19: Canyon Mesa Country Club Town-home with Red Rock and Golf Course Views. 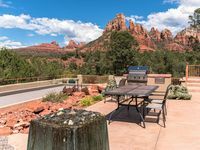 Property 20: Visit beautiful Sedona in the red rock mountains! Property 21: One Bedroom Condo! Country Club, pool, hot tub, golf, tennis! No pets, please. Property 35: Get away from it all at Sedona! Brand New 2 Bedroom 2 Bath Condo .Great views . Property 36: Brand New 2 Bedroom 2 Bath Condo .Great views . Property 41: NEW! SERENE 2 BEDROOM APT. SURROUNDED BY FOREST, GOLF COURSE & RED ROCK VIEWS! See the red rock mountains with Sedona! Property 46: See the red rock mountains with Sedona!